Luke Skywalker is a damage dealing ranged character. He relies on critical hits to deal tonnes of damage and disable enemies. We will be doing a quick guide on what he has to offer to your team. Basic Ability: Frontier Marksmanship – Deal Physical Damage to target enemy. If this attack scores a Critical Hit, gain 30% Turn Meter and inflict Damage Over Time for 3 Turns. 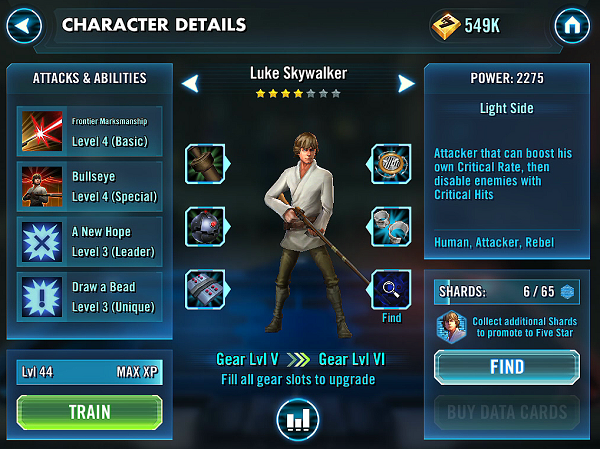 Unique Ability: Draw a Bead – Luke has a 34% chance to gain Critical Chance Up for 2 turns at the start of each of his turns. Leadership Skill: A New Hope – All allies gain 45% Tenacity. Luke is a good single target assassin that works very well against low target enemies like Count Dooku, Darth Sidious, IG-88 just to name a few. He can one shot 75% health squishy targets when he criticals using Bullseye. If you have him in epic gear, he deals even more damage. You will want to pair him with either IG-88 or Darth Sidious as leaders for the critical rate bonus. He is also a great disabler once you get his unique ability to level 5 or higher. His second skill can stun and prevent enemies from counter attacking. This works well against people like Kylo Ren and Count Dooku. He can also shred high hp enemies with his first skill as well. All in all, he is a solid damage dealer that you can count on. His health is decent for an attacker and will not die as quickly. I suggest you farm him as your first attacker if you didn’t pull any great attack characters like Jedi Anakin, Count Dooku or Darth Sidious. Plus, light side lacks damage dealers, so he is a great addition to the Light squad. Verdict: Farm and max him as your attacker! 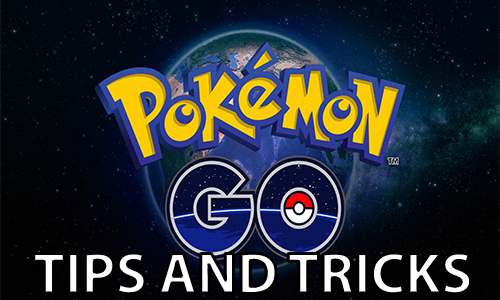 Pokemon Go Guide [Tips and Tricks] to Catch Them All!